Novotel Ambassador Gangnam introduces a unique family package "Dear My Family" for the warmest family vacation of the year. 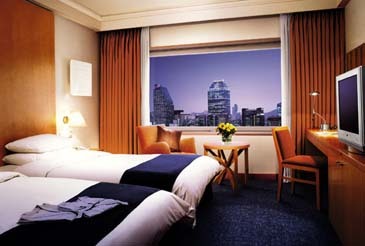 Affordably priced at 145,000won, the package is a great way to experience the luxurious features of urban hotel. The package includes a night at Deluxe Room, breakfast at the bistro, free access to swimming pool and sauna, welcome drinks at Gran*A. The family deal also features 2 tickets to a family animation produced by Sony Pictures, "Boog & Elliot" and its merchandise for the first 100 guests. The package is available through January 28, 2007. Up to 2 children under 16 can be accompanied by parents with no extra charge and 50% discount is offered for additional purchase of package for accompanied children. Reserve your own "My Dear Family" and have the sweetest gathering with your family for your unforgettable winter memories. 4) 2 tickets for family movie "Boog & Elliot"
** Free up to 2 children under 16 accompanied by parents & 50% off on additional package purchase for children.